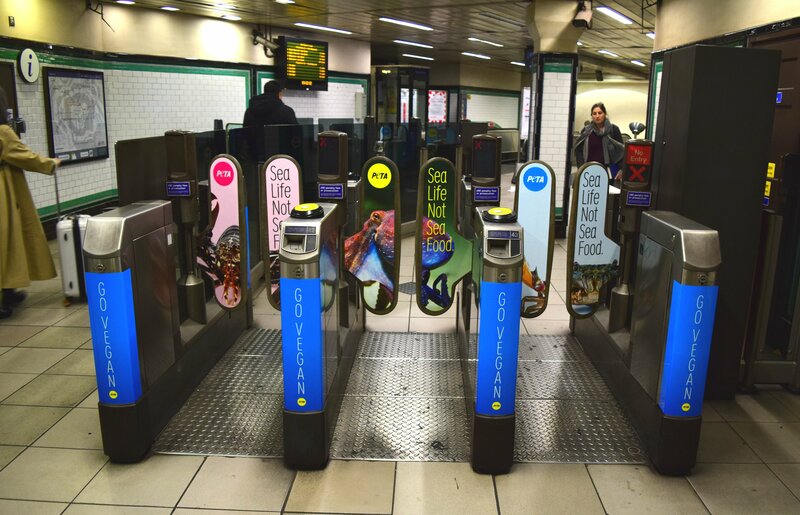 Vegan charity PETA is taking over Clapham Common station in London with more than 50 posters urging passers-by to consider the fact that sea animals also face exploitation and cruelty by the food industry. 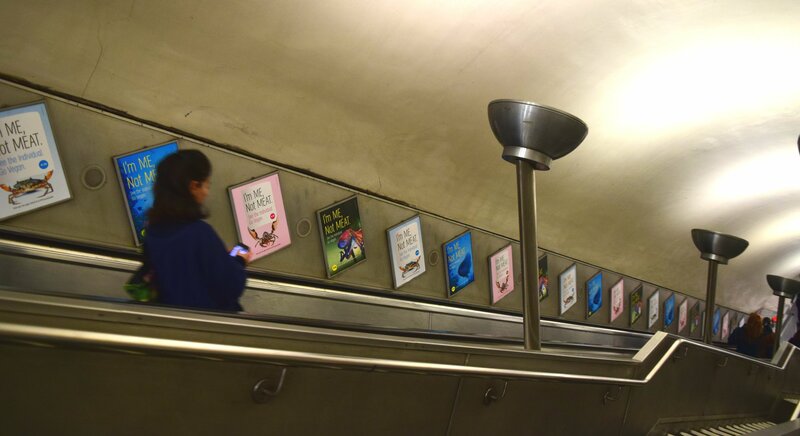 PETA has taken over Clapham Common with a series of posters for World Vegan Month that urge passers-by to spare a thought for the sea animals exploited in the food industry. Just like humans, fish, crabs, octopuses, and lobsters feel pain and fear, have unique personalities, and value their own lives, but are often consumed by people who believe they do not experience pain and fear in the same ways as other animals. Every year, billions of sea animals are slaughtered for food. 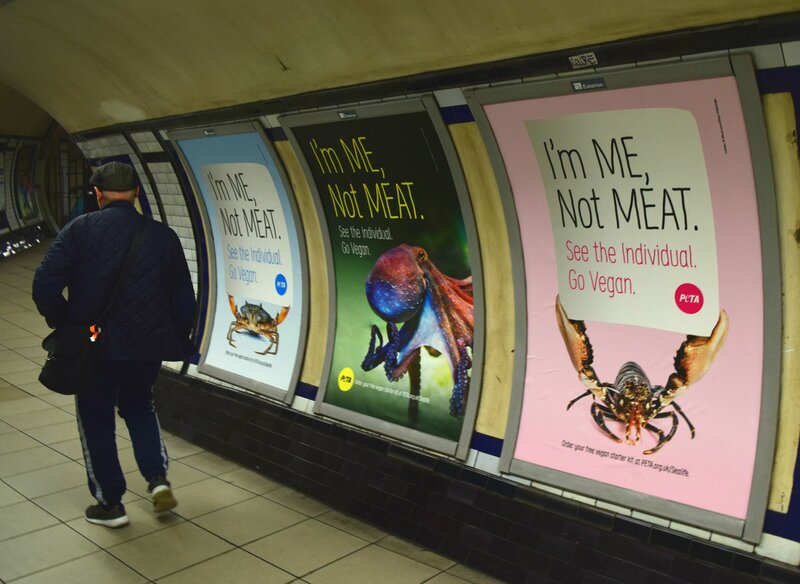 Their nervous systems are similar to our own, meaning they can feel pain, but they’re usually killed in slow, agonising ways, such as being left to asphyxiate on the decks of fishing boats, boiled alive, or eaten while they’re still conscious. A PETA US investigation of a crustacean abattoir revealed that live lobsters and crabs were impaled, torn apart, and decapitated – even as their legs continued to move. According to the animal rights charity: “Chefs typically place live lobsters in pots of boiling water while they’re still conscious – a cruel practice that has been banned in Switzerland – and some cut off live octopuses’ limbs and serve them still writhing to customers. “Fish slowly suffocate or are crushed to death when they’re dragged from the ocean in huge nets, and the throats and stomachs of those who survive are cut open on the decks of boats.